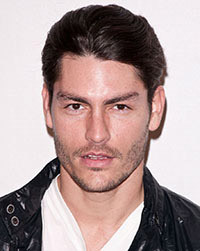 Tyson Ballou was born in Garland, Texas, United States, on November 14, 1976, is an American male model. He was discovered by model scout from modeling agency Page Parkes. He began his modeling career at the age of fifteen. Ballou made his modeling debut in his home town for JCPenney in 1995. Long time highly ranked on Supers Men, Top Icons Men and The Money Guys Models.com list. Tyson's hobbies are golf and basketball. He dated Brazilian model Fernanda Tavares. He made his big screen debut in drama film The Black and White Maze of the Painted Zebra (2010) in role as Tiger Blackmore. Pan Am in episode Romance Languages (2012) in role as Italian Man #2. Details Cover, Vogue Italia, Harper's Bazaar UK, GQ Style Germany, Vogue Hommes, V Man, Hercules Cover, 25 Magazine, Dansk, GQ Style Russia Cover, W Magazine, Man About Town, L'Officiel Hommes Italia Cover, Arena, GQ Australia, Elle Men Mexico, Harper's Bazaar Australia, V Magazine Cover, GQ France, Vogue Russia, Vogue Italia, Numero Homme, American Vogue. Armand Basi, 7 For All Mankind, Jimmy Choo, Calvin Klein, Calzedonia, Hugo Boss, Banana Republic Holiday, Il Bacio di Stile, Salvatore Ferragamo, H&M, Sisley, Jones New York, Biotherm, Dior, Dolce & Gabbana. Walked runway for Michael Kors, Rag & Bone, Iceberg, Tommy Hilfiger, Ralph Lauren, Hugo Boss, Dolce & Gabbana, Bottega Veneta, amfAR. Represented by agencies Wilhelmina New York, Why Not Model Management Milan, Select Model Management London, Next Company Vienna. I would say stay true to yourself don't try and change who you are. At the end of the day I love my job and that is what makes me happy. I know that this job will not last forever, so I'm going to complete an apprenticeship as an actor. My first campaign I did when I first started my modeling career was for Calvin Klein Mens clothing. Be professional, polite, and don't let people's opinions about your physical appearance be the image you have of yourself.